Baji Quan is a dynamic kung fu system that specializes in close range combat using explosive strikes with the elbows, shoulders, knees and hips. Stances are low but mobile, and the arms move in wide circles. Integral to Baji Quan is the tactic of closing in from longer range using a special charge step known as Zhen Jiao. The foot is stamped downward and you leverage on the recoil to generate added power for the strike. Like Chen Style Tai Chi, Baji Quan makes use of the silk-reeling force where power is redirected from the ground through the feet and released through the point of contact in a coiling manner. Baji Quan relies mainly on the hands. There are few kicks in the style, and most of these are aimed low. There are roughly 20 fist forms within the style as well as weapon forms covering eight different types of weapons, including the spear, sword, saber, staff, Pu Dao, Two Handed Blade. 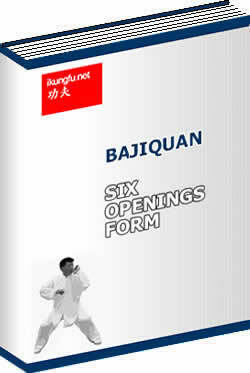 The main forms of Baji Quan include Six Openings Form (Liu Da Kai), Eight Methods Form (Ba Da Jiao), Baji Quan Mother Form (Mao Jia), Baji Quan Introductory Form (Ru Men Jia), Six Elbow Heads (Liu Zhou To), Baji Quan Continuous Punch (Ba Ji Lian Huan Quan), Close-Body Leaning (Tie Shen Kao), Baji Quan Small Form ("Ba Ji Xiao Jia”) etc. The core of the style’s techniques is found within Six Openings Form and Eight Methods Form. Baji Quan originated as a Northern Chinese art, although it is now practiced throughout China in modern times. It was known as Bazi Quan ("Rake Fist”) because in the signature fist position of the style, only the thumb and index finger are closed inward to form the fist with the remaining fingers held slightly open. This fist is then used to strike downward like a rake. However, this name sounded inelegant in Chinese, and so the name of "Eight Extremities” Boxing was adopted because it shared the same sound but was more elegant on paper. Baji means Eight Extremities in Chinese and its meaning originates from I-Ching, the ancient Chinese Book of Changes. Modern Baji Quan is commonly traced to over 270 years ago. Legend has it that a Taoist, Zhang Shi Feng (1646 - 1727) , who was highly skilled in Baji Quan taught the style to a Hebei villager Wu Zhong (1712 - 1802). After training with Baji Quan for over 10 years, Wu tested his skills with the monks of the Fujian Shaolin Temple and emerged victorious every time. Our eBook contains an illustrated guide to the concepts and techniques of Baji Quan before introducing the beginner-level form Six Big Openings together with examples of how the techniques can be applied in combat. Known as Liu Da Kai in Chinese, the form teaches the opponent the six concepts of power generation and how it can be used to open up the opponent’s guard to strike. The illustrations for the form itself comprise of over 100 carefully created color diagrams in addition to the many illustrations in the main body of the eBook.